Yes, the Craigslist site is ugly. It will never win any design awards. Phrases like eye sore come to mind when looking at it. Many a designer has offered up thoughts on how to improve it by presenting a redesign, some of which are truly beautiful. However I think the existing Craigslist design is perfectly fine for what Craigslist the site is and I’ll explain why in this post. Let me assure you I’m not crazy. Ok, maybe a little crazy. Depends who you ask. I do like beautiful things and I think aesthetics are more important than most will give them credit for. 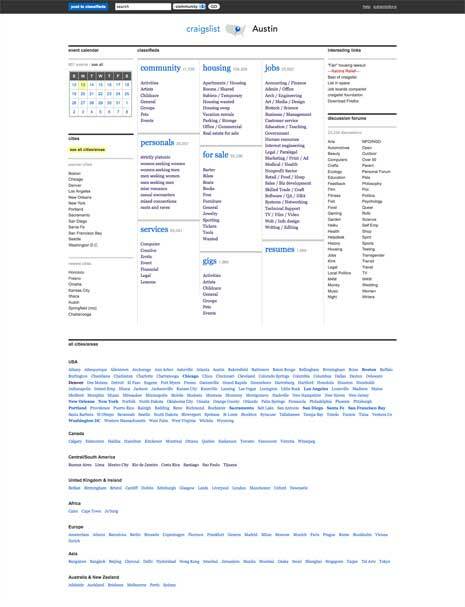 If I were designing a similar site today I would aim for a better aesthetics than the current Craigslist design and many of the redesigns that have been presented for Craigslist are better designs. I’ll point you to a few below and you can see part of one in the image above. And yet there’s little to no reason for Craigslist to change unless they’re interested in rebranding the site. As you read through this post keep a couple of questions in mind. What is the purpose of design aesthetics? 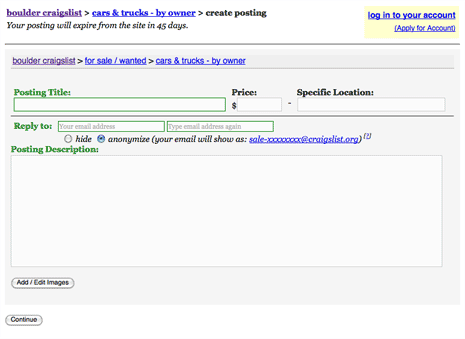 A caveat: If Craigslist were my site I would absolutely redesign it. Like many I’d like to see a more aesthetically pleasing Craigslist. My point in this article is more to get you to think about the 2 questions above and to do that I want to build a case for why the existing Craigslist design is near perfect for what Craigslist the site aims to be. Craigslist is an online version of the classified section of the newspaper. I’ve used it on and off over the years and know many people that use it regularly. I’m sure you’ve been there a time or two as well. While I can’t speak to the motivation of everyone who visits the site I think it’s safe to say there are two main reasons anyone interacts with Craigslist. I would suggest the latter group above makes up the majority of Craigslist users. Neither of the above tasks is difficult to do with the existing design. In fact both are quite simple. You likely won’t make many errors attempting either task. Odds are you’ve been to the site and already know how to do both, but let’s assume you’re visiting Craigslist for the first time. In that case you’d be presented with the image below. The home page of Craigslist is simply a list of locations. Presumably you’re visiting the home page with an understanding of what the site is about and it wouldn’t take you more than a moment to look for the location nearest to the one you want. Having found and clicked on the location you want you’ll be presented with a page like the one for Boulder, Colorado below. On subsequent visits a cookie set by the site will take you directly to this local page when you visit the home page, something most people probably want. Let’s assume you visited Craigslist to look through the ads, more specifically you’re looking to buy a used car. How hard is it to find the ads? The first thing you’ll likely notice on the page is the list of links in the center. The headings above each section contrast well enough and the wording seems clear enough. It shouldn’t take long to find the “cars+trucks” link under the “for sale” heading. Clicking that link you’re presented with a list of ads ordered by date posted, which is exactly what you were looking for. How much could the above process be improved by a redesign? Now let’s assume you’re at the site to post an ad. Again you start at the home page of location links and find the geographic location you’re interested in. Again you probably notice the list of links first and scan them. You’ll either click into one, thinking the posting mechanism is inside, or you’ll continue to scan the page. If you do the latter it shouldn’t take more than a few moments to find the “post to classifieds” link below the Craigslist logo. If on the other hand you miss that link and click deeper into the site, it’s admittedly a little more difficult to find the link you want. There is a link to post in the upper right on some pages, though having the link read “post to classifieds” or “post an ad” would probably be a better choice. Still it isn’t likely going to take you much time to figure out how to post a classified ad (as evidenced by the many millions of ads that have been posted) and having done so once it should take even less time on subsequent visits. There are definitely other things people do on Craigslist such as post to the forums or look up events in the events calendar. Neither of these is any more difficult to find and I’ll still argue the overwhelming majority of visitors want to either post an ad or see the ads others have posted. Some secondary goals are perhaps slightly more difficult to complete, but none are really what you would call difficult. In a few minutes on the site you’ll likely figure out how to do most if not all of the things you want to accomplish on the site. Ugly as it might be, it’s rather intuitive what you should do on every page of the site. 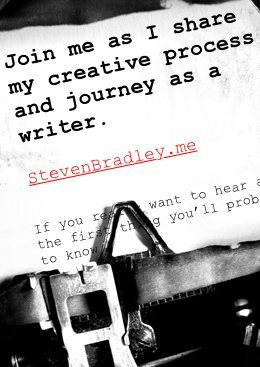 Some things could perhaps be a little easier, but I doubt many have landed on a page and spent more than a second or two wondering what to do next. I’m not privy to internal meetings at Craigslist and can’t tell you what they want their brand to be, but when I think about Craigslist I think of classifieds. I think of individual people posting ads to sell things they no longer want. I think of people seeking a roommate or a room for rent. I also think of local businesses listing various jobs. I don’t expect any of the items I’m looking to buy or sell to be highly polished. I think more garage sale and flea market items than luxury items. Let’s face it, Craigslist is facilitating the exchange of one person’s crap to another person who has a use or want for it. You don’t expect to visit a garage sale and find a beautiful showroom. You expect a bunch of tables stacked with other people’s unwanted things and you’re looking for something you either happen to need, but don’t want to pay full price for or the occasional gem who’s value is unknown to the seller. Everything you do at Craigslist is highly utilitarian in purpose. You’re looking to get in, do what you want to do, and get out. You aren’t looking for aesthetic beauty. If anything a beautiful Craigslist could easily give the wrong impression of what you’ll find inside. Walking into a beautiful showroom you’ll likely expect higher prices and more luxury items. Beautiful aesthetics could send the wrong message as to what Craigslist is. It’s non aesthetic look actually aligns quite well with the brand of Craigslist. Quite honestly the only reason I see Craigslist redesigning the site is if they want to rebrand themselves as something other than what made them what they are. I don’t see that happening and it would probably make more sense to start a sister site with another brand than to rebrand Craigslist itself. None of the above is to suggest that as is the design is perfect. Even without a full redesign there are some small improvements that could easily be made. The “post an ad” links could be more visible, by increasing their visual weight across the site. Most redesigns do this. The “nearby cl” and other headings in the right sidebar could also use some additional visual weight to make it clearer what’s in the sidebar. The links themselves could be kept as they are. The title of the event calendar could be better. Maybe events in boulder or what’s happening in boulder this month would make it more obvious the event calendar list events in your area. Some pages could expand in width to better accommodate 1024×768 and higher resolution. Most pages on the site are fully liquid and expand from edge to edge though. While not my favorite layout, I’ve never found the liquid layout to slow me down on the site. Consistent navigation across the site could be added. As designed now the back button calls for frequent use. (I typically open most links in a new tab often cluttering my browser window) It’s generally easy enough to reorient yourself, but at times better navigation would make it quicker to find what you want. While I think all of the above would improve the existing design, none dramatically increase the usability of what is already a pretty usable site. Even were you to apply all the changes above I don’t know that your ability to get things done on Craigslist would remarkably change, especially for an existing userbase that is already familiar with how to do things on the site now. Interestingly enough MacLIfe reviewed several iPad and iPhone apps for using Craigslist a few months ago. 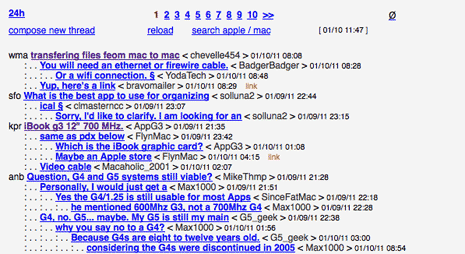 Most of those apps are more aesthetically pleasing and probably offer a better overall design than the Craigslist site and yet MacLife came to the conclusion that visiting the site directly in Safari still was still the best option. I mentioned at the start that many a designer has given the site a new look. Some are truly great designs, my favorite being the one created at SXSW a few years back and seen above. You can visit a semi-working example of the SXSW design here. Compare this design to the existing Craigslist design and honestly answer whether using the SXSW design is any quicker or easier than the actual Craigslist site, despite how much better it looks. 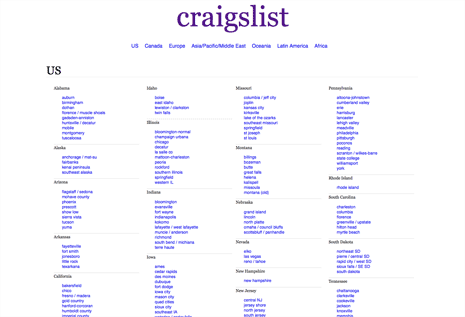 A couple of years ago Wired Magazine asked some designers to come up with a new look for Craigslist. As with the SXSW designs, the redesigns for Wired are definitely more aesthetically pleasing than the existing Craigslist design, but would they genuinely make it easier to use the site? I don’t think so. In fact in one case the redesign (Under the Make It Beautiful heading) would probably make it harder to use the site, and again I think this design gives the exact opposite impression of what Craigslist is. It is a beautiful design, though much more appropriate for an upscale shop. 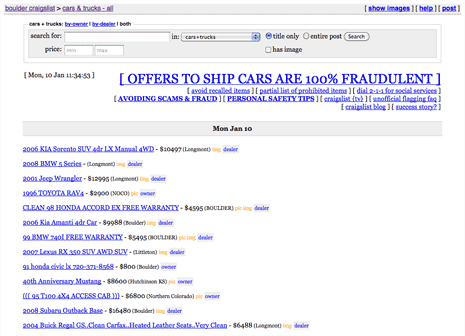 Below are a few more attempts to redesign Craigslist. Most have more pleasing aesthetics and some are downright gorgeous. However as you look through them ask yourself if they’d honestly improve the utilitarian purpose of Craigslist and the usability of the site. 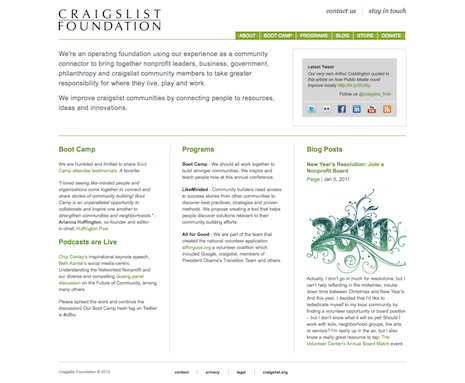 Our Craigslist – My second favorite of the redesigns. It’s the design in the image at the top of this post. Yes Craigslist is an unattractive site. In fact it’s downright ugly. It’s aesthetics are poor and could certainly be improved in a number of ways. And yet the site doesn’t need a redesign at all. It’s highly usable as is and it’s lack of aesthetics fit very well with the brand. You could easily argue it’s lack of aesthetics helped the site grow to what it is today, because it fit so well with the brand. Does that mean the design of Craigslist should never be updated? No. A few things could easily receive minor updates to improve the functionality of the site. Some of those updates will probably never happen in part due to the stubbornness of Craig Newmark, but in truth they aren’t necessary, and the site does update things every so often. Ugly as it is, Craigslist is fine and unless it wants to undergo a major rebranding there’s no reason to touch the design. Ask yourself again what is the purpose of design and design aesthetics and then think about Craigslist the site and brand and you’ll find the existing design is near perfect for what Craigslist is meant to be. 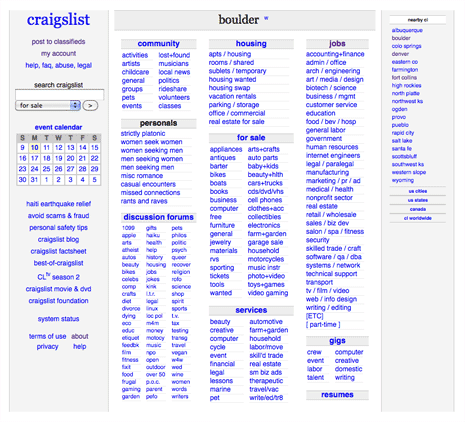 Again like most designers and many non-designers I’d like to see a more beautiful looking Craigslist. The aesthetically challenged design is not one I would create were I asked to do so today. My point in this article isn’t that Craigslist as currently exists couldn’t or shouldn’t be redesigned. My point has been to get you to think about the purpose of design and the purpose of design aesthetics and see both in the context of what Craigslist is all about. Hopefully I’ve challenged you to think about your answer to both. I think craigslist is doing a lot with the same design and rather than consider a totalitarian redesign, they should think about opening up an API so developers can use their data to provide the kinds of interfaces you, and I, would like to see. 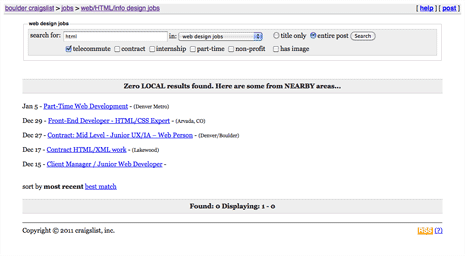 I have a prototype here that takes into consideration the usability of searching for web design jobs, and that is all. Opening their API would be nice. It’s certainly up to them whether they do that or not, but many developers and designers would be happy. Is it another case of function over aesthetics? I don’t think so. I think both are important in any design and they should work together. By no means do I love the look of Craigslist, but in this case you do have to wonder if the current aesthetic needs changing. The lack of any real aesthetic does fit with the brand and what the site is. It would still be function and aesthetics working together. Just that in this case the lack of aesthetics could be the right aesthetics. Honestly, I think the simplicity of craigslist is branding in itself. Who doesn’t recognize craigslist when they see it? Now it definitely is. I think so many people have seen the site at this point that it would be hard for it not to be. I think sometimes we forget. The point you are making is self-evident (I hope), but while I’d had much the same thought in my head for a while, you wrote it much more lucidly. Sometimes, it pays to look bad. Sometimes, you wish to avoid giving the impression that you paid to look good. If Lucy VanPelt’s Psychiatry 5¢ booth had a professional receptionist, HIPAA forms, and a slick “tap your iPhone and go” payment lanes, I’d be mighty suspicious. Sadly some things that should be self-evident never are. I’m sure you’ve experienced that. Irrespective of the design or color, Craigslist is still the best classified ever in USA. I always wonder how they (craigslist,reddit etc.) answer this question. I don’t think either site really needs to. They work and their users are able to do what they have to. In both cases the content is good enough to keep people in spite of any lack of design. I think, also people are afraid of change. Even though it may have been frustrating at first using these sites, a complete redesign would confuse and scare many people! Fear might be too strong a word, but people definitely don’t like change. You’re right that if a redesign was too different it would likely turn people away. Really interesting article! This topic is really relevant for our website right now because we are looking at a complete redesign. It is true that Craigslist does not aesthetically appeal to most people, however it does convey the correct message to users: it is cheap and easy. Is this always what you want though? Sure, it is simple to use, but you never know who you are communicating with…kind of scary! The website can be like some of the people using it: not very friendly. I’m glad you liked the post. I can see you have a similar site so I can understand why this post would be relevant. Craig’s List may not be the most beautiful site, but it works fine for what you’re supposed to do and I think most people figure out how to use the site pretty quickly. Now if I was building the site I’d do what I could to make it more aesthetically pleasing, but I’m not sure it’s necessary for the existing users of the site. Who uses 1024×768 monitors these days? Nobody buys a monitor or lap top nowadays that is not wide screen, nobody. Whenever I read these sorts of ‘improvement’ posts, what always gets me is how little attention designers are paying to hardware. Widescreens people – quit obsessing over color schemes and start talking about how 98% of websites are optimized for screen sizes that people no longer buy or use. I guess you’ve never heard of an iPad, which has 1024×768 resolution. Not everyone has or uses a widescreen display. And even those people that do have widescreens don’t always have them open to full size. Not everyone has purchased a new computer in the last few years either. Stats for this site, which generally attracts web designers and developers who you’d expect to have widescreen monitors, show that about 10% of the visitors to this site still use a 1024px wide screen. 10% is significant, especially when you consider it’s likely higher for sites with a less tech topic. Entry is FREE and not only you’ll get the chance to show your personal vision of how Craigslist should look like but also there are some nice cash prizes to compete for. Thanks Guillermo, though in the future please be upfront and let people know you’re pointing them to your contest and not one you happened to find. Thanks Steven. I really wasnt trying to hide that I’m part of the organization of the contest, I guess i just didn’t come out right. Next time I’ll be sure to make it clear. When the entires are in could you send me a link to them? I’ll be interested in what people come up with.